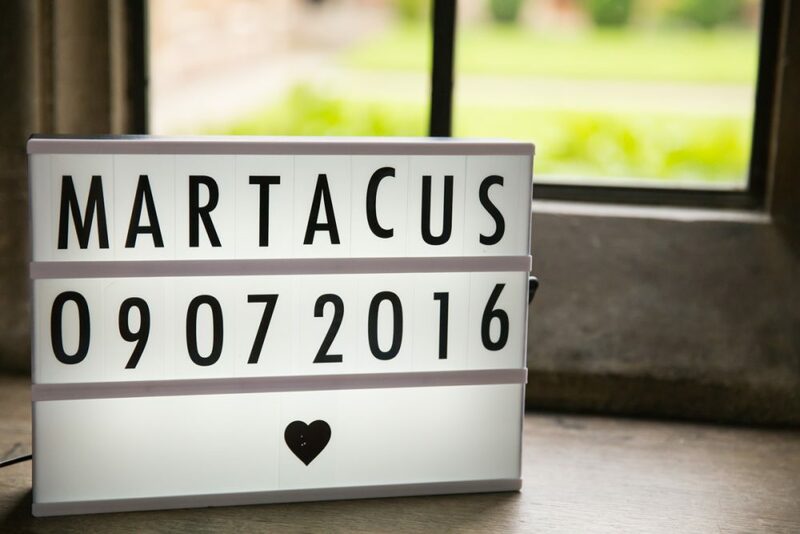 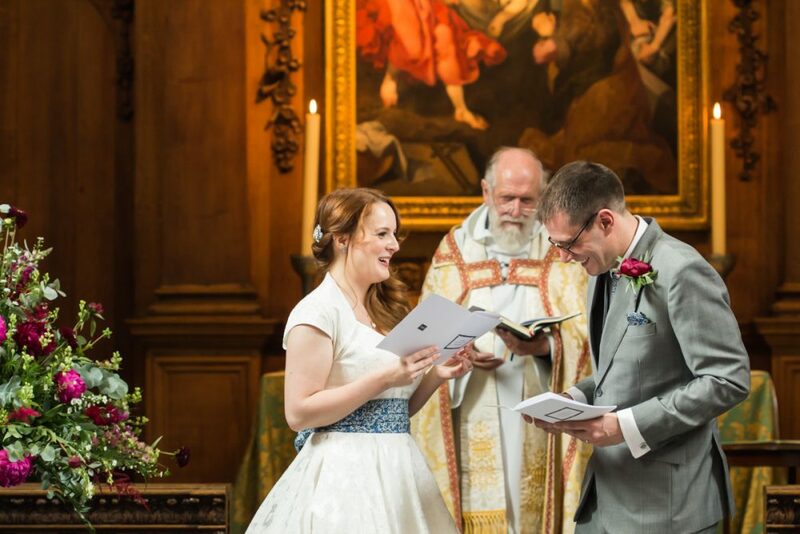 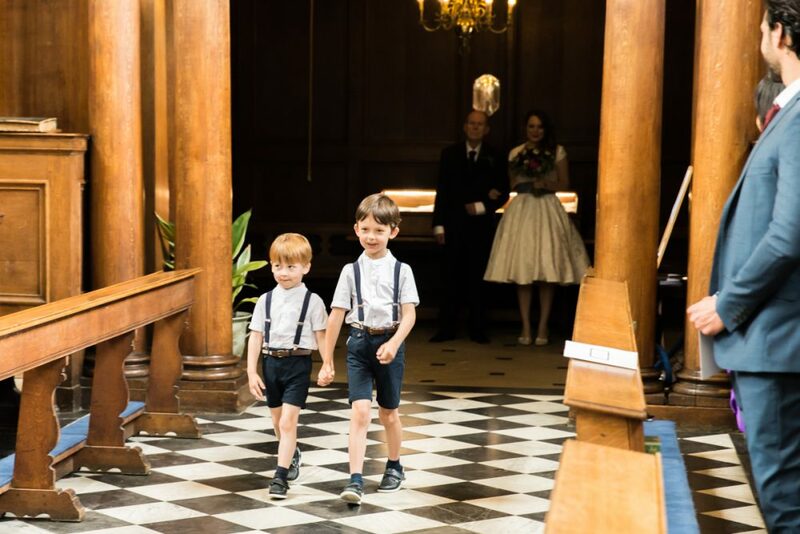 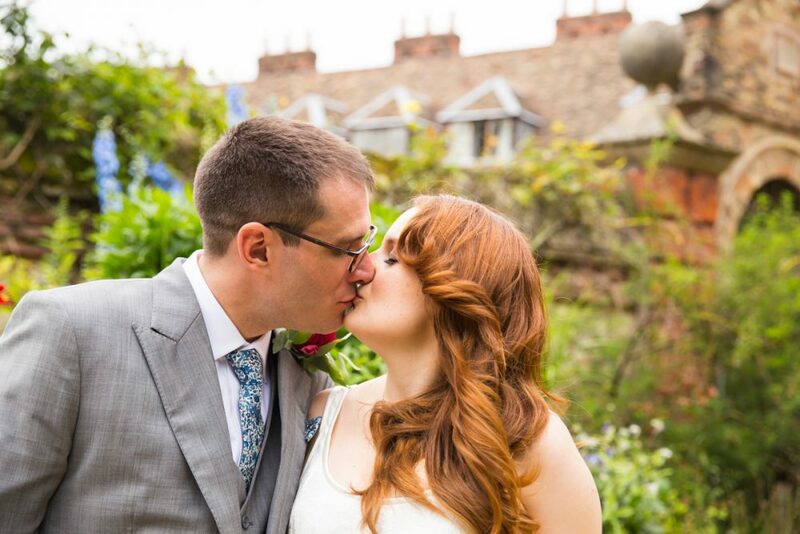 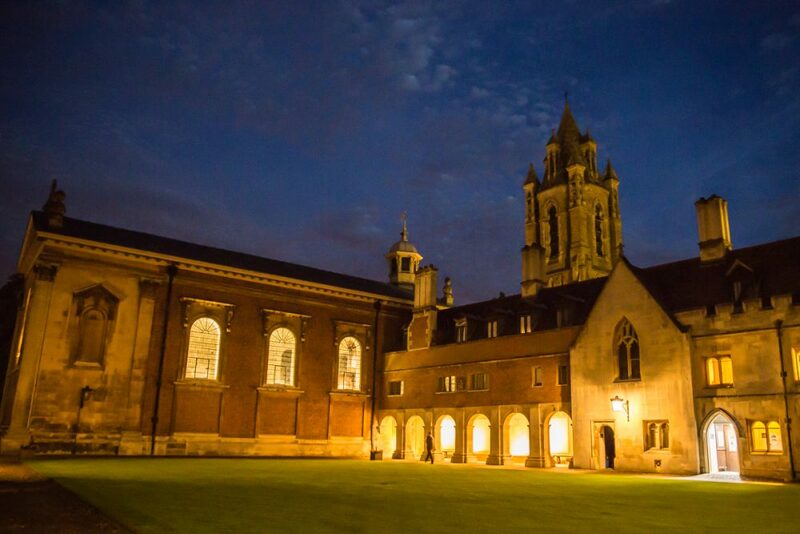 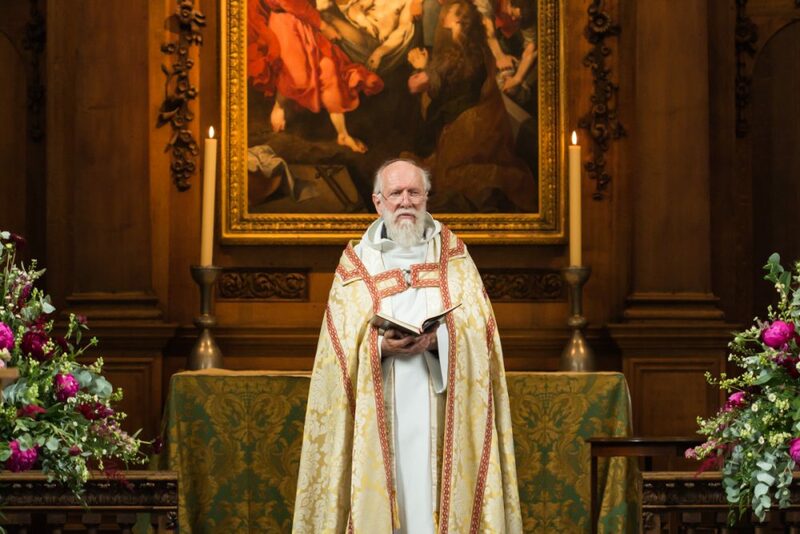 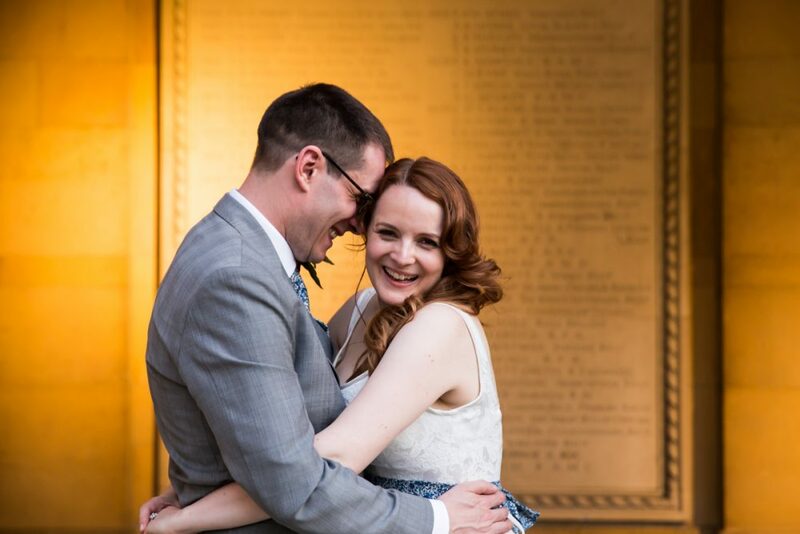 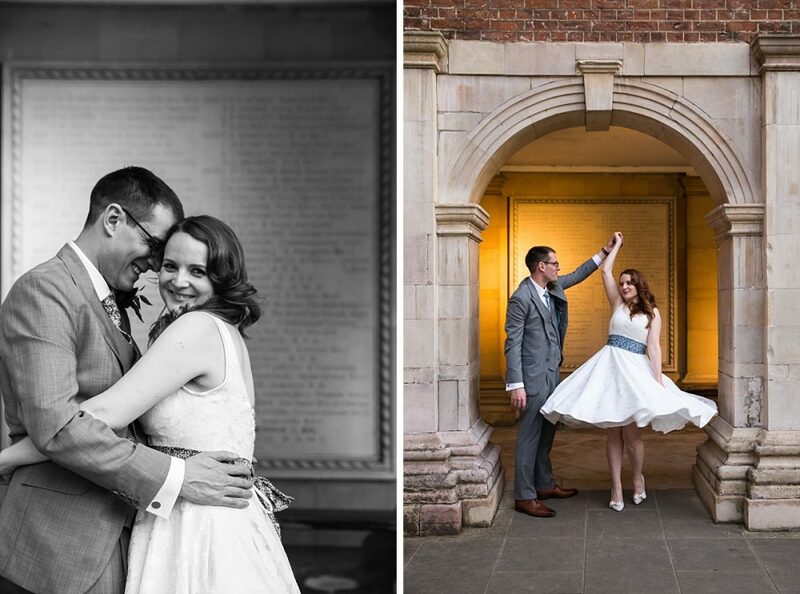 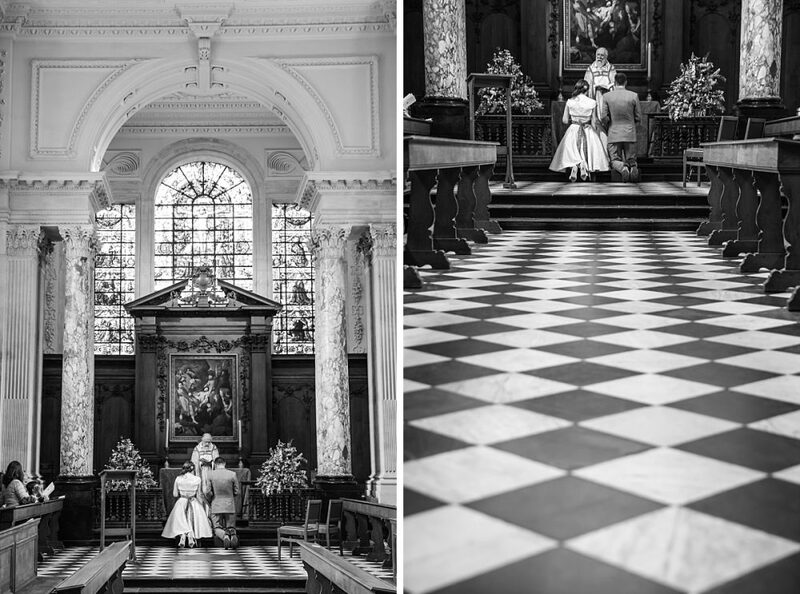 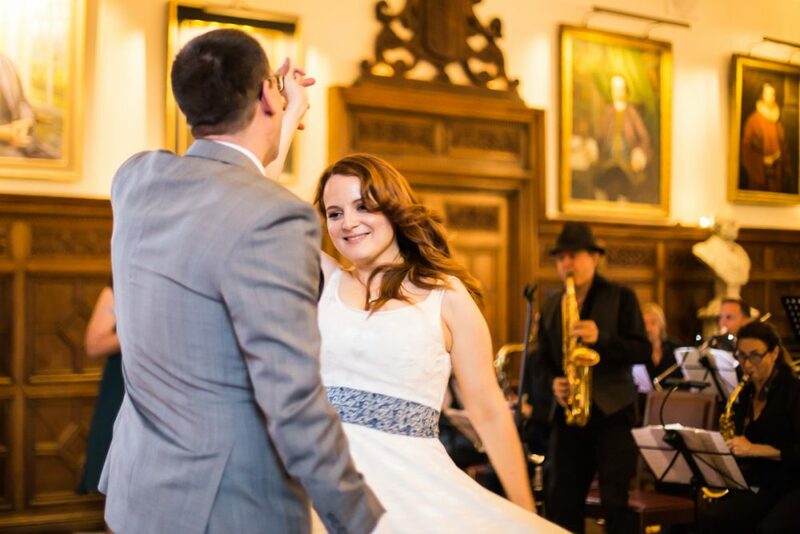 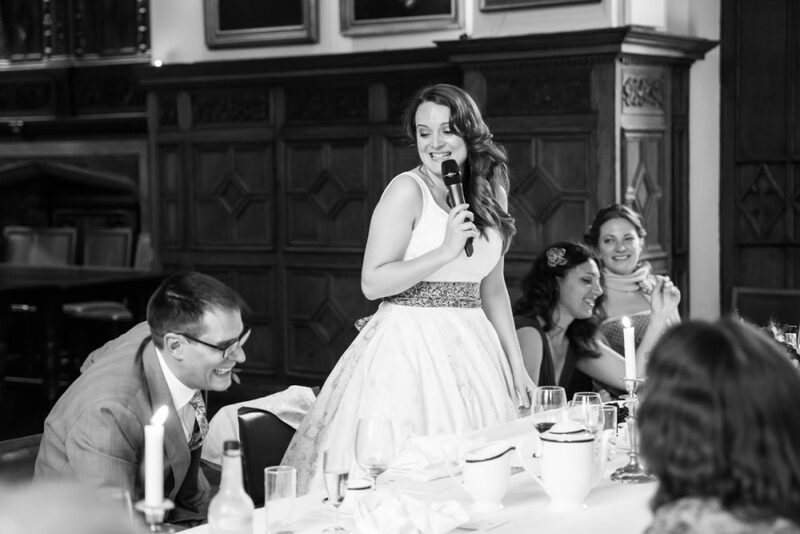 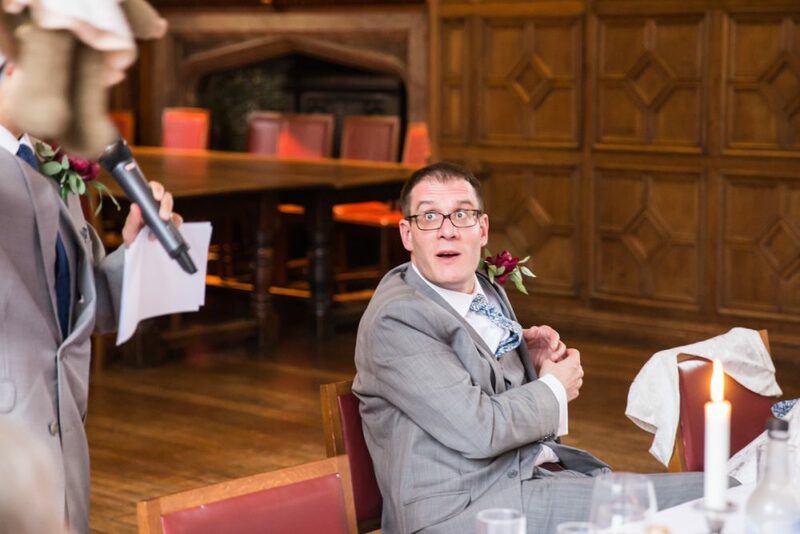 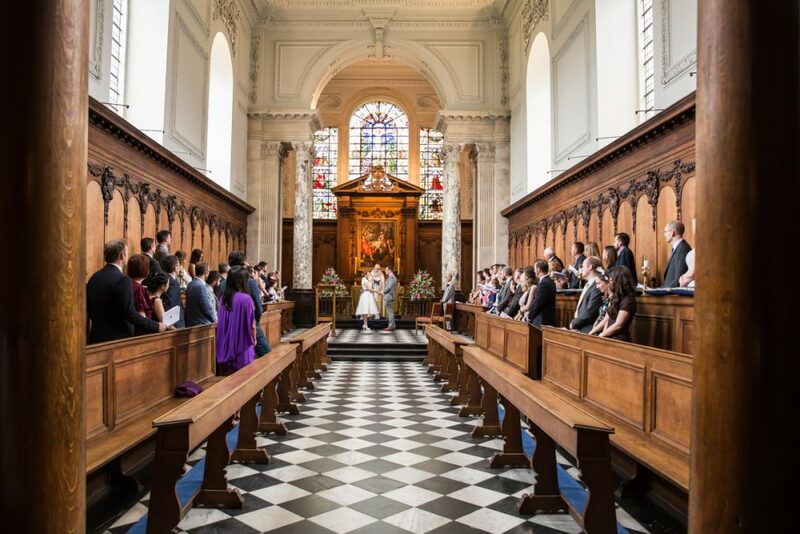 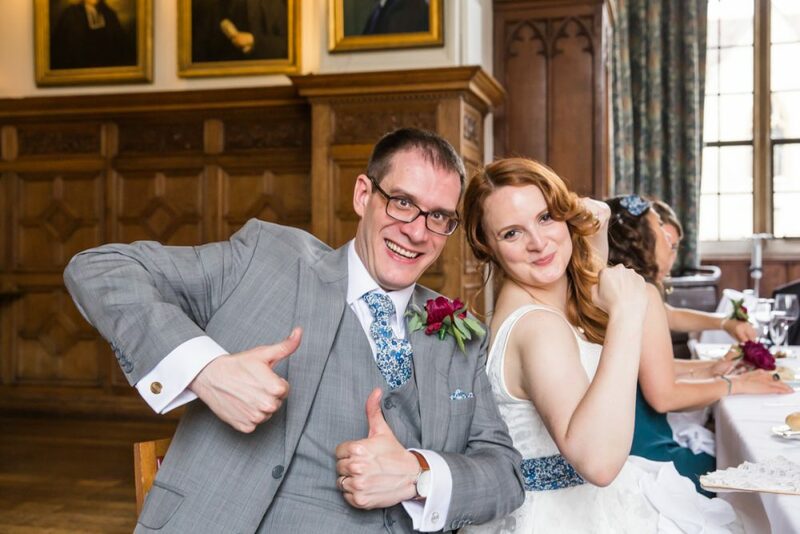 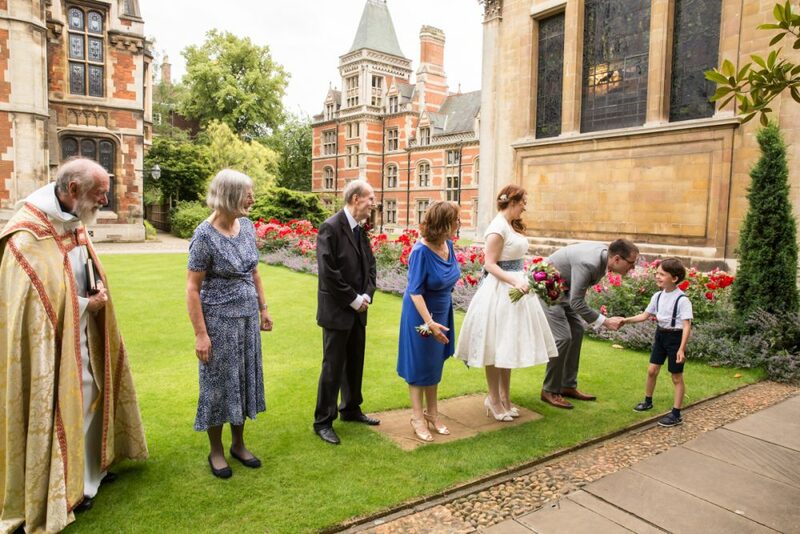 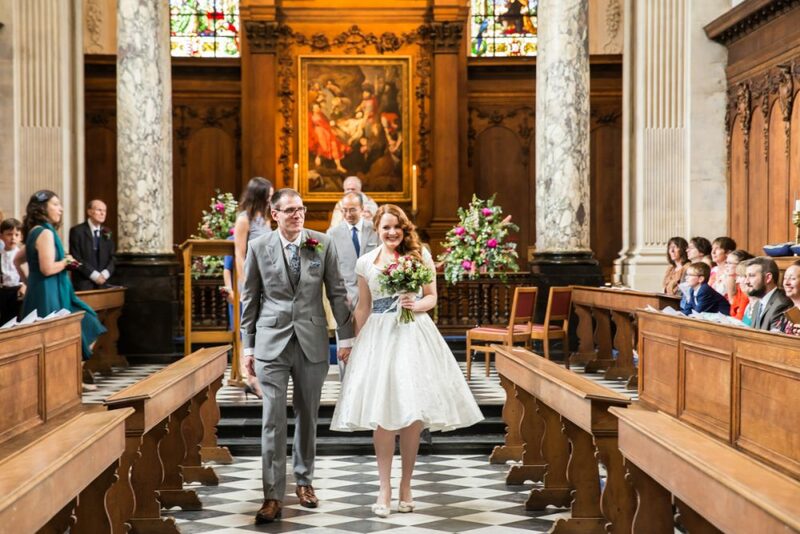 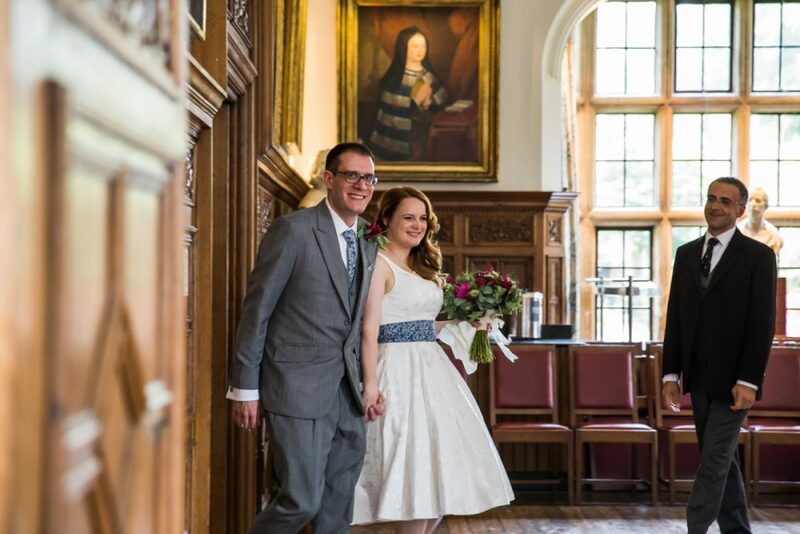 Marta & Marcus planned their Pembroke College wedding as this is where Marcus studied. 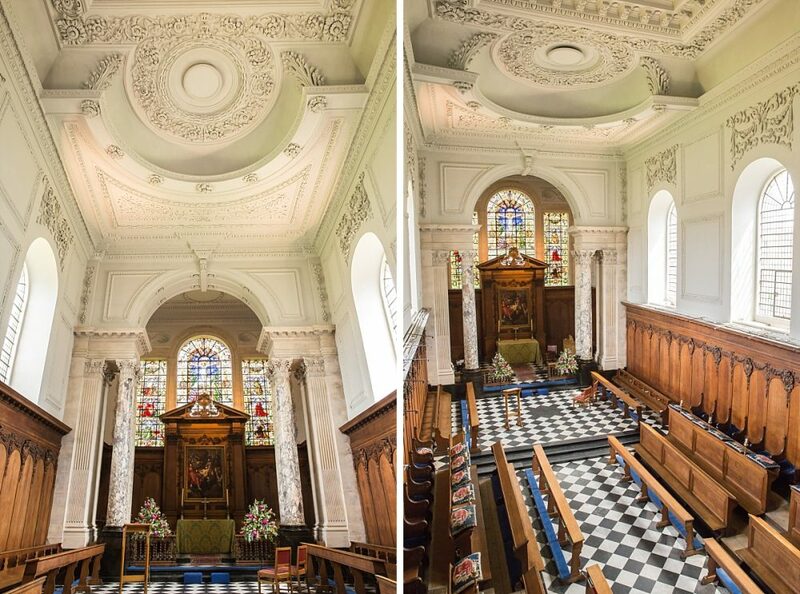 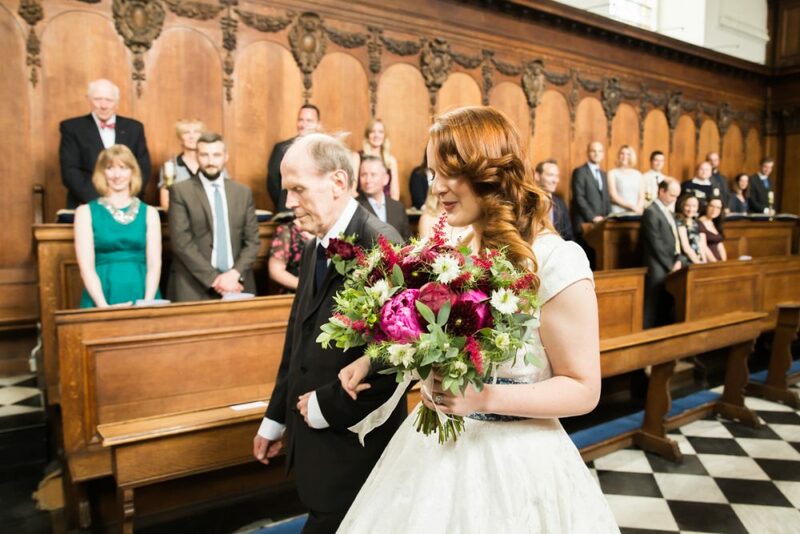 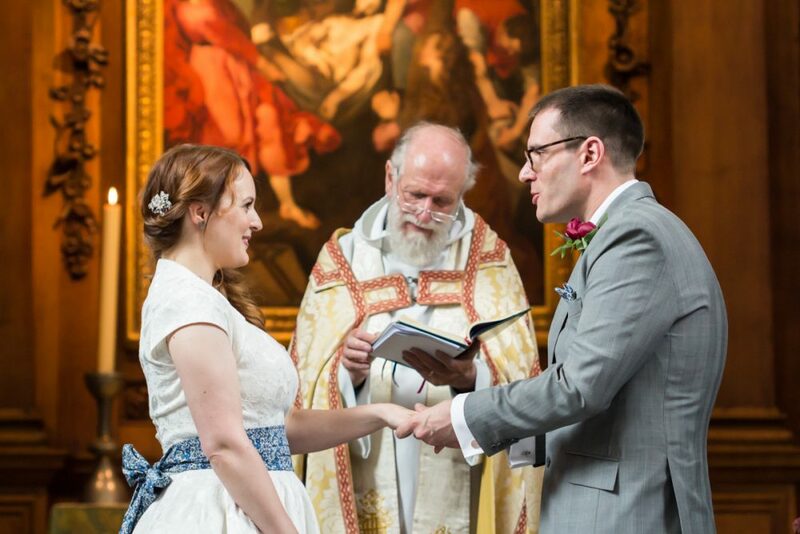 Marcus’s father had also studied and got married there, and as an extra special touch he was able to conduct Marta & Marcus’s wedding ceremony in the beautiful Pembroke Chapel. 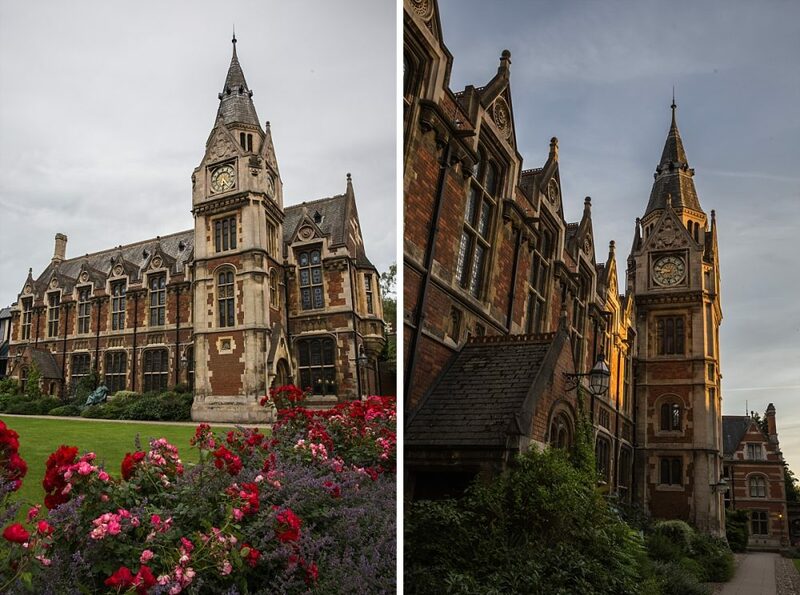 Marcus had shown me round the college during their Pembroke College engagement shoot so I already knew their day would be full of striking buildings, quiet courtyards and pretty flowerbeds. 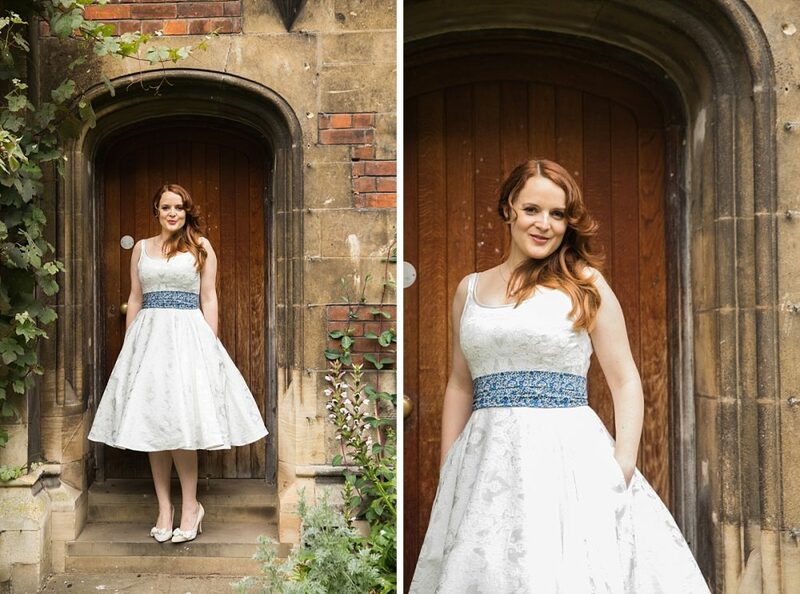 Marta chose a stunning FairyGothMother wedding dress – short, with pockets and a blue liberty print sash – together with delicate Rachel Simpson wedding shoes and a bouquet of deep red flowers. 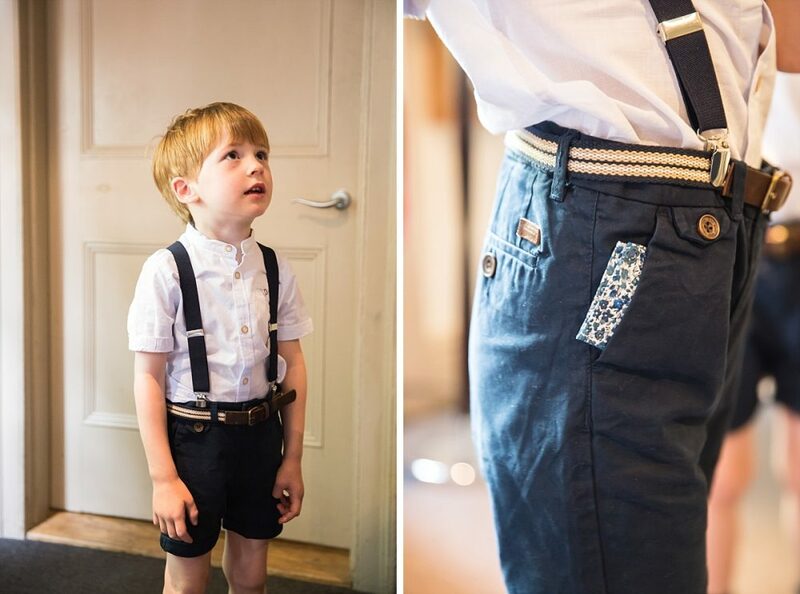 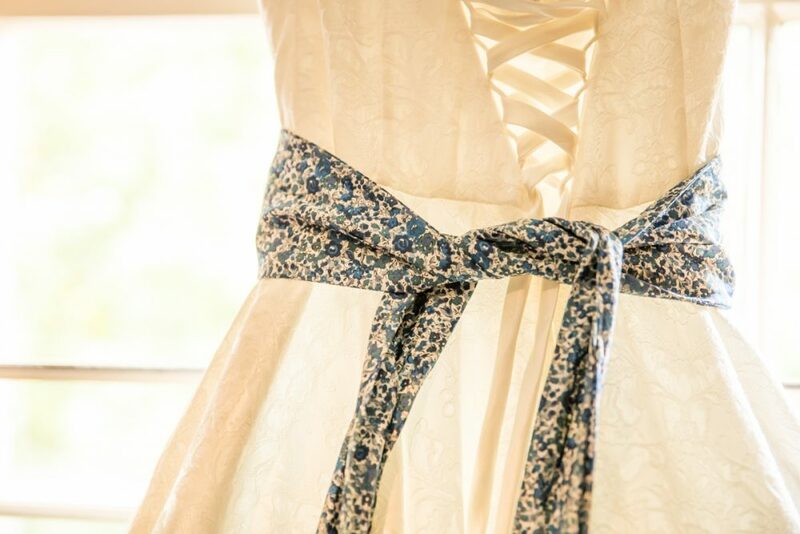 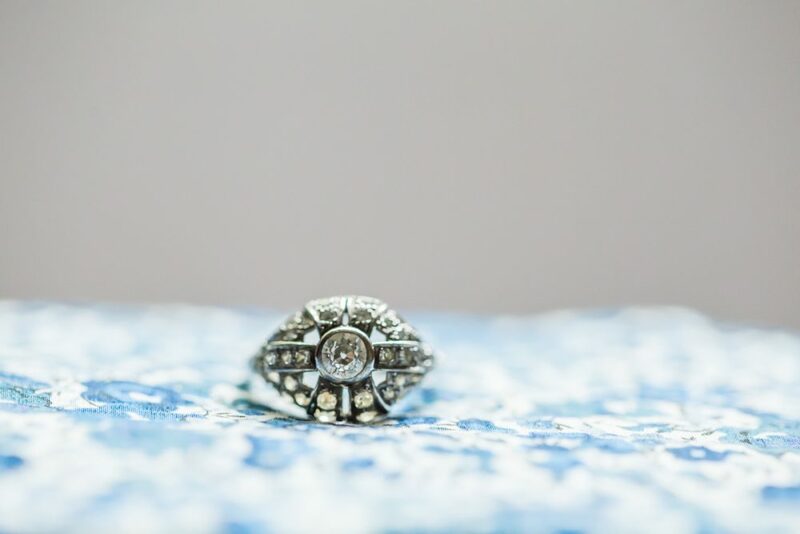 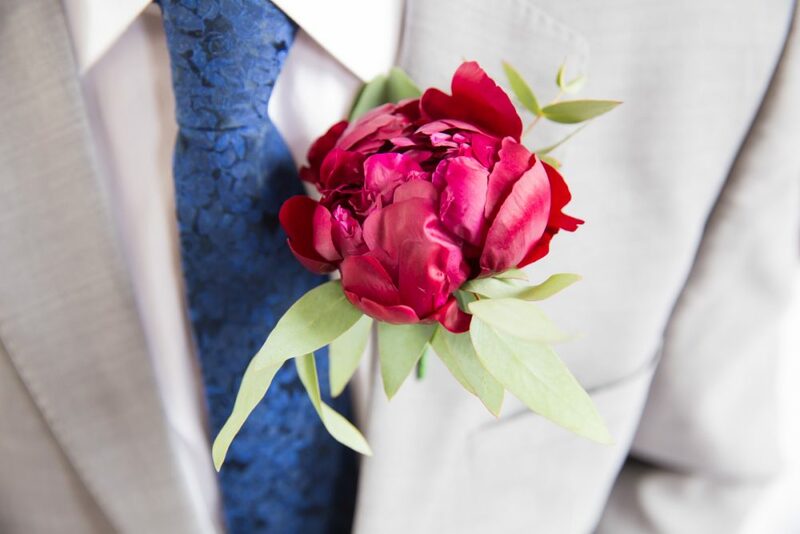 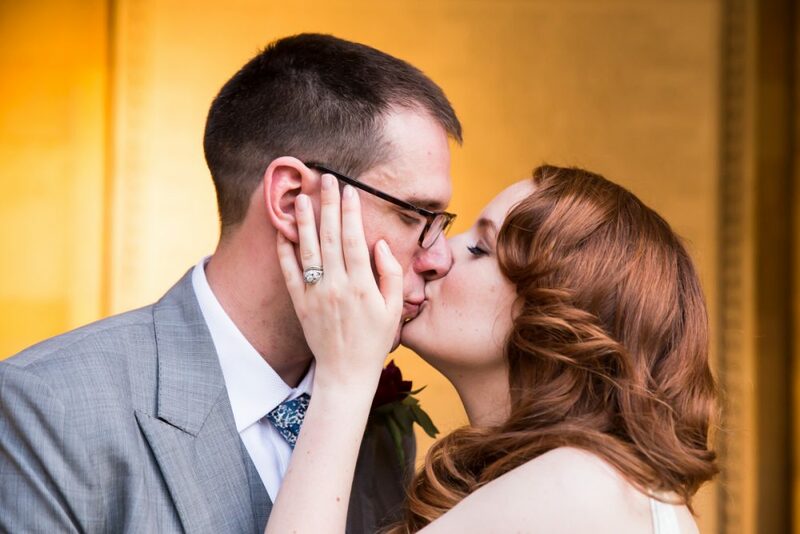 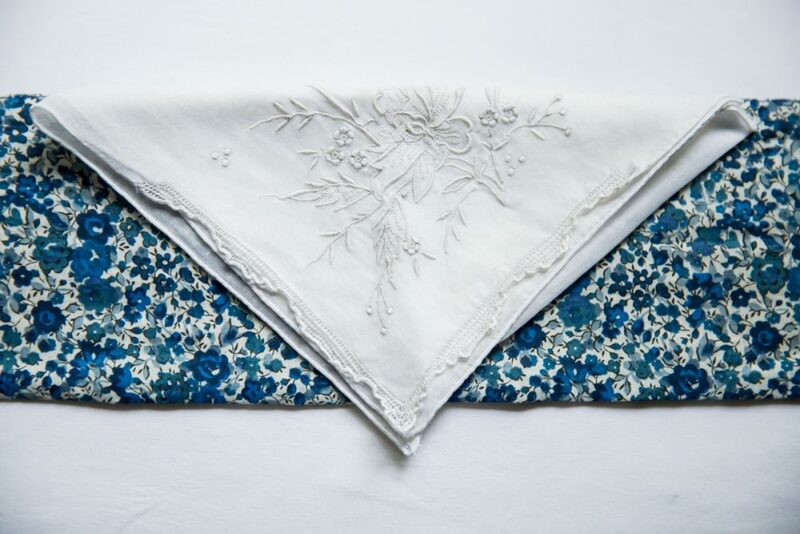 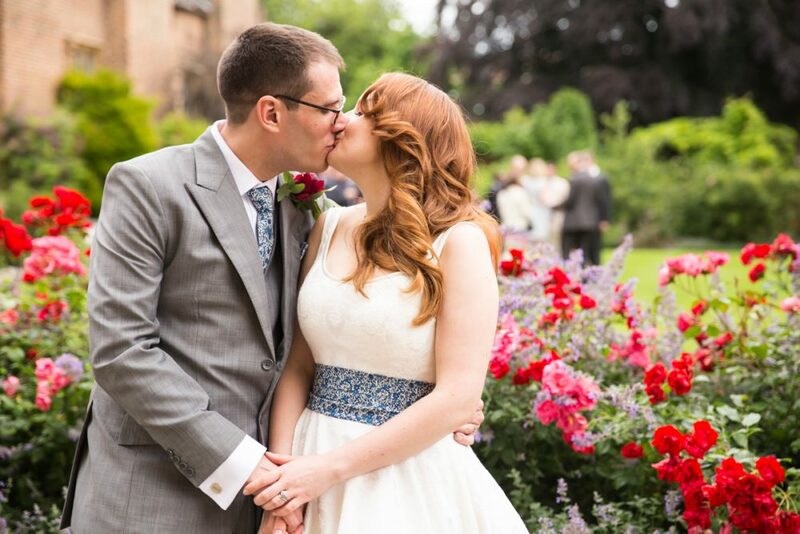 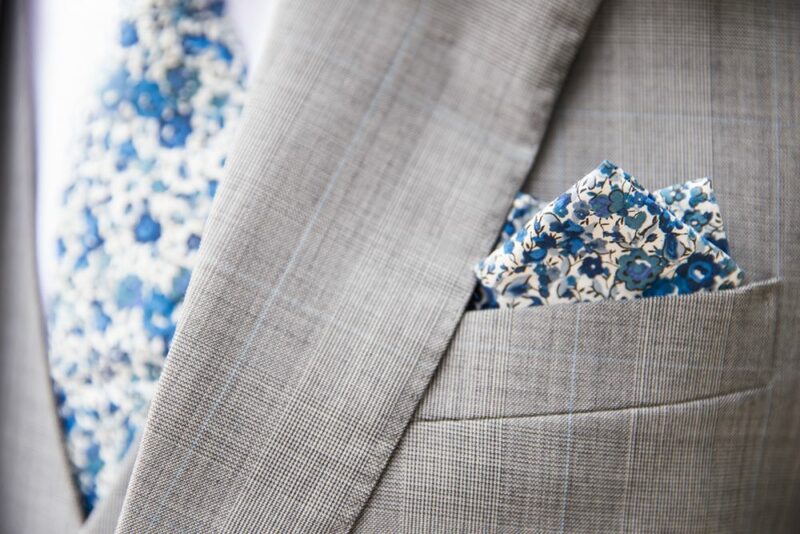 They planned a relaxed wedding with vintage touches, Liberty prints and music all day long. 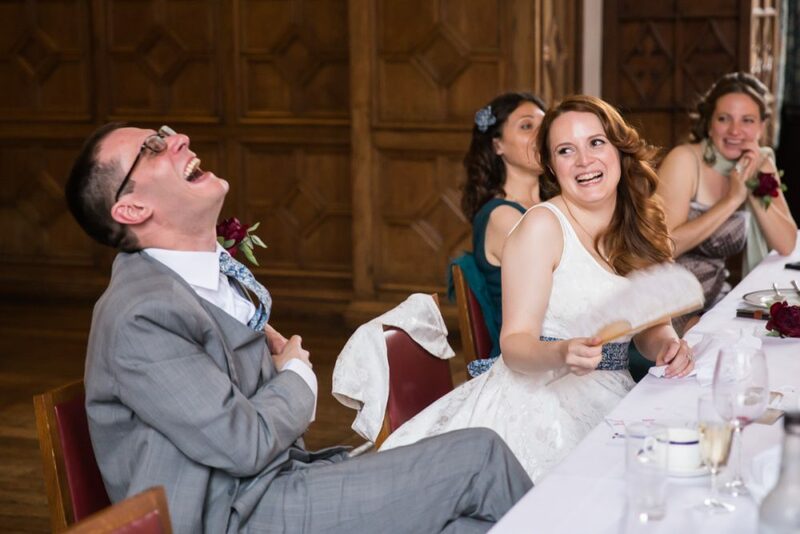 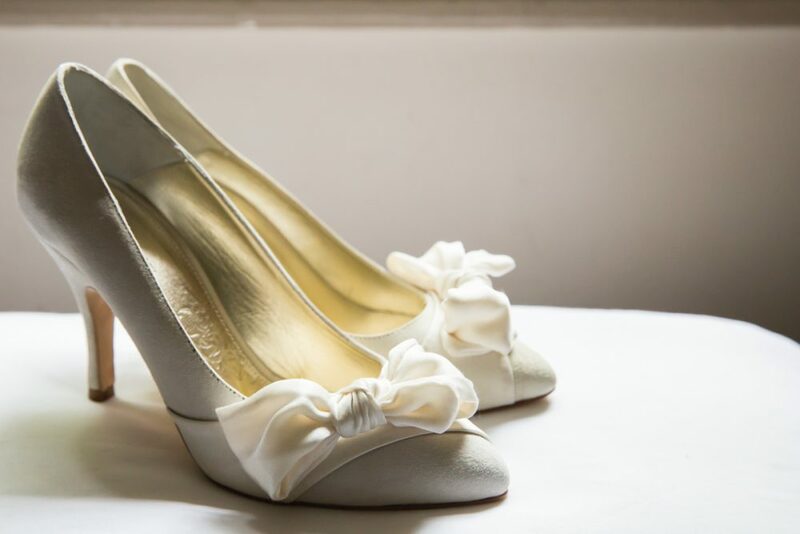 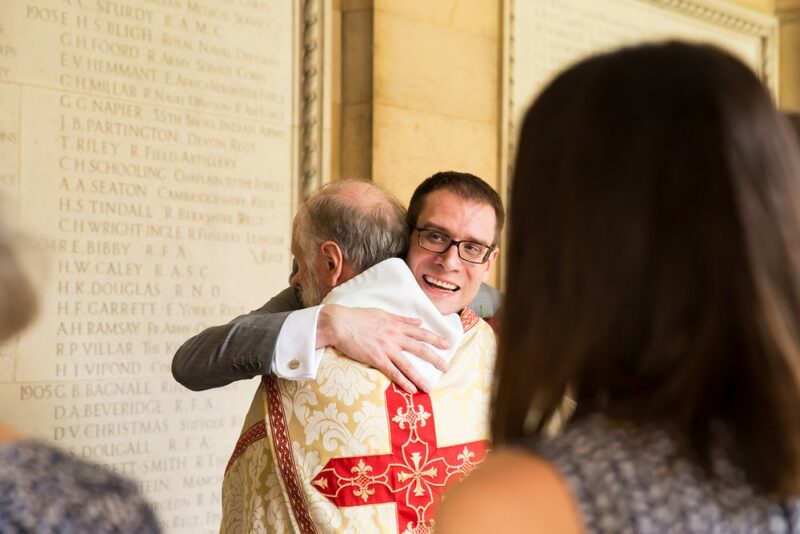 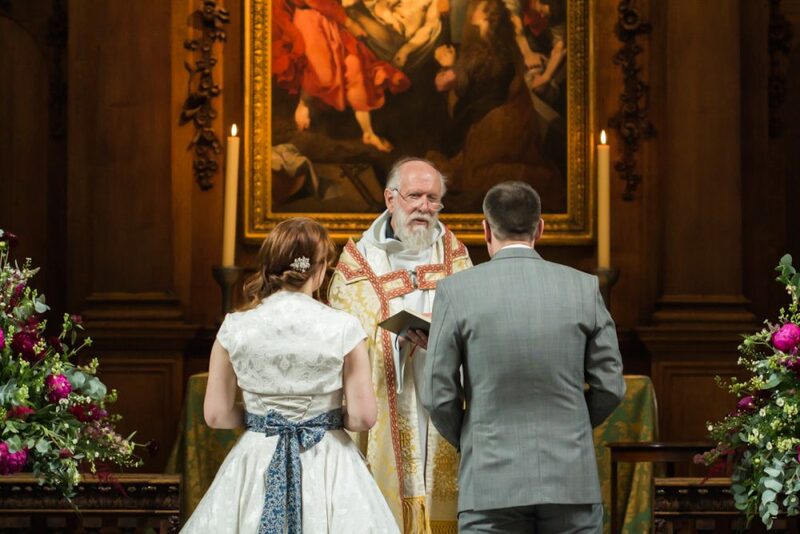 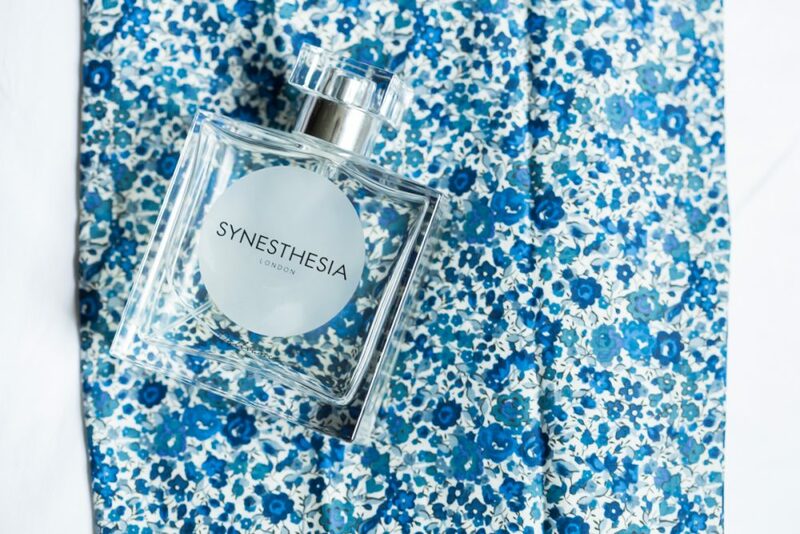 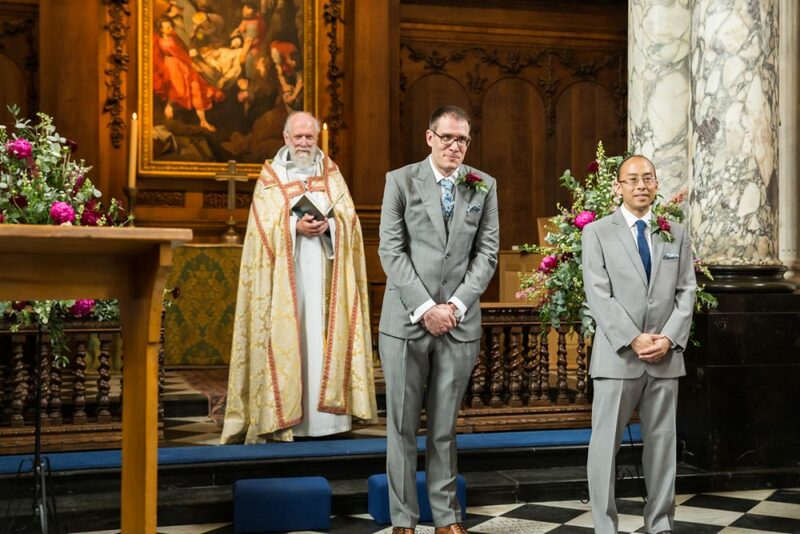 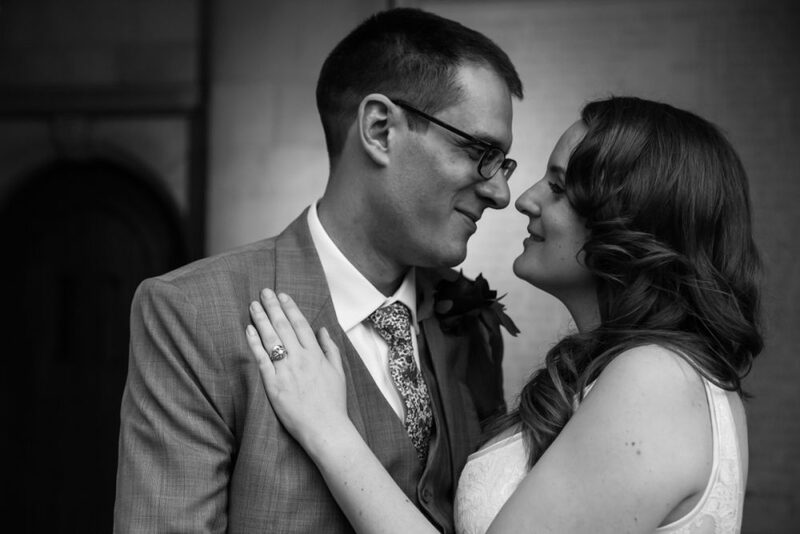 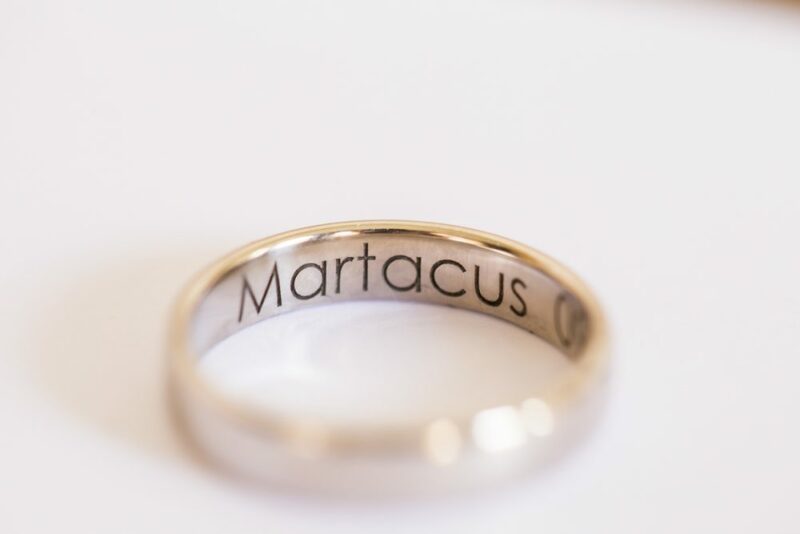 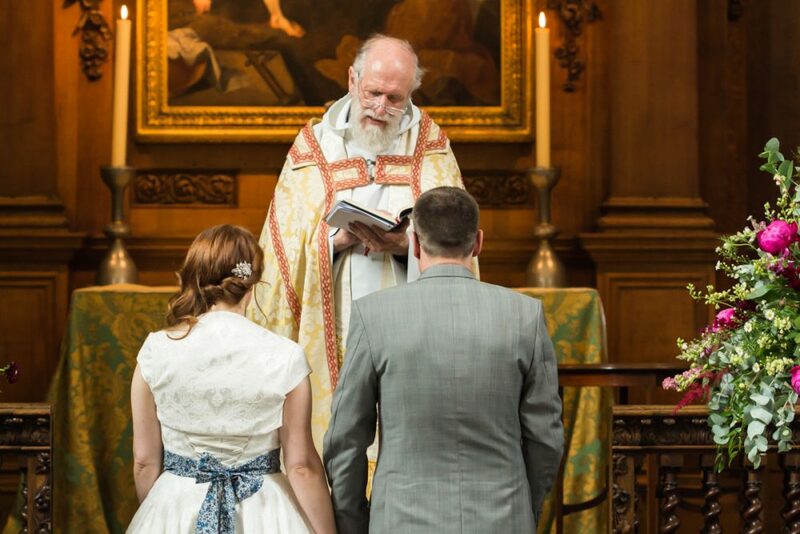 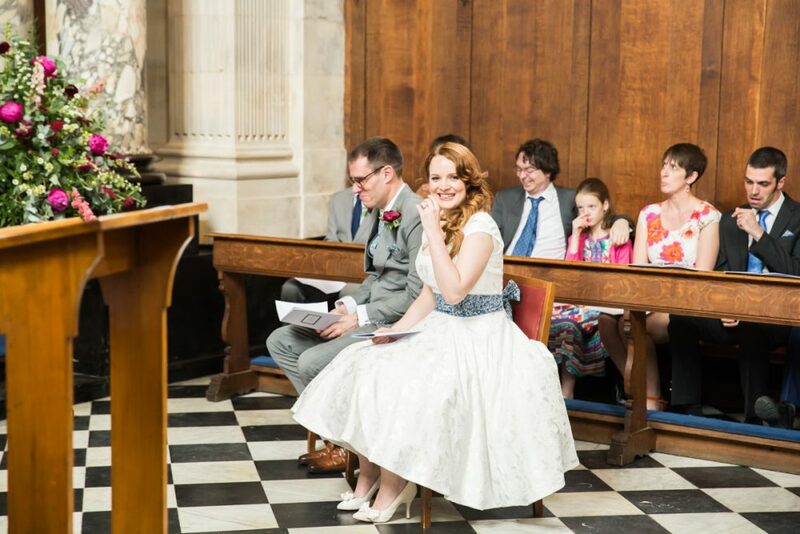 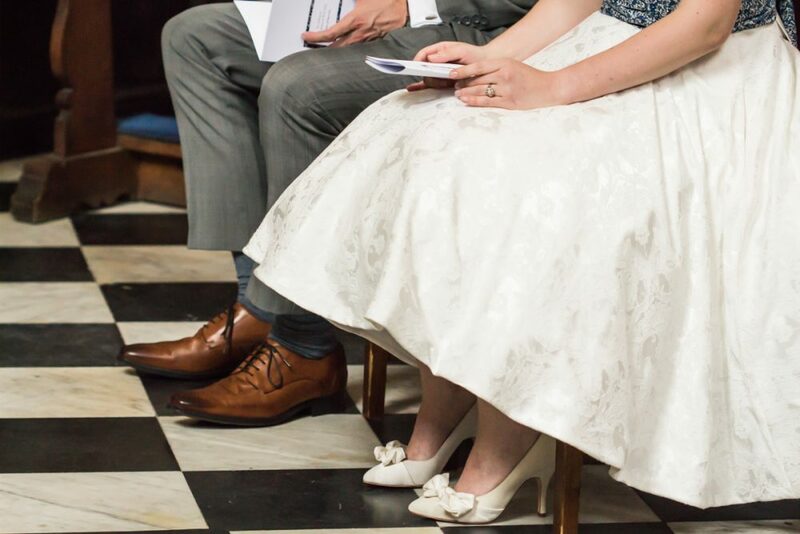 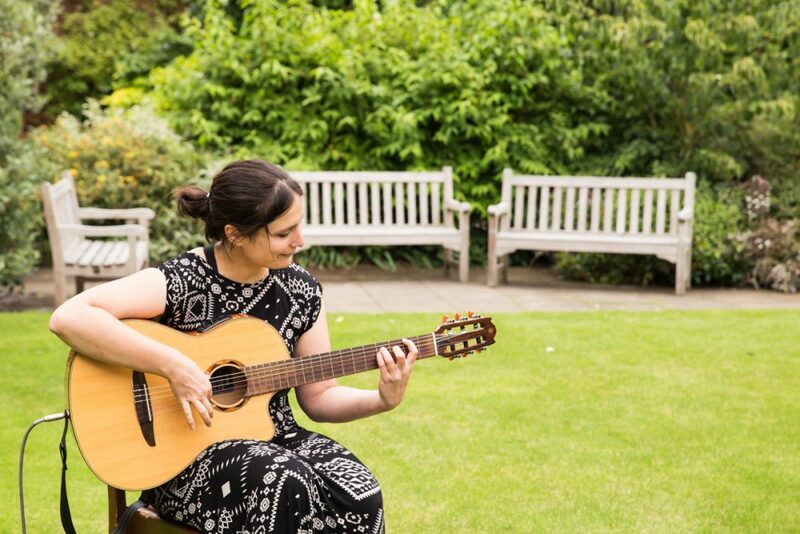 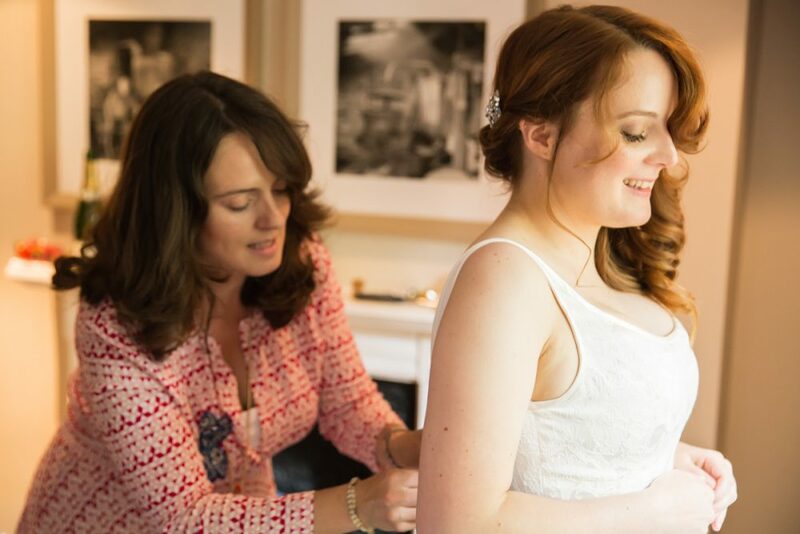 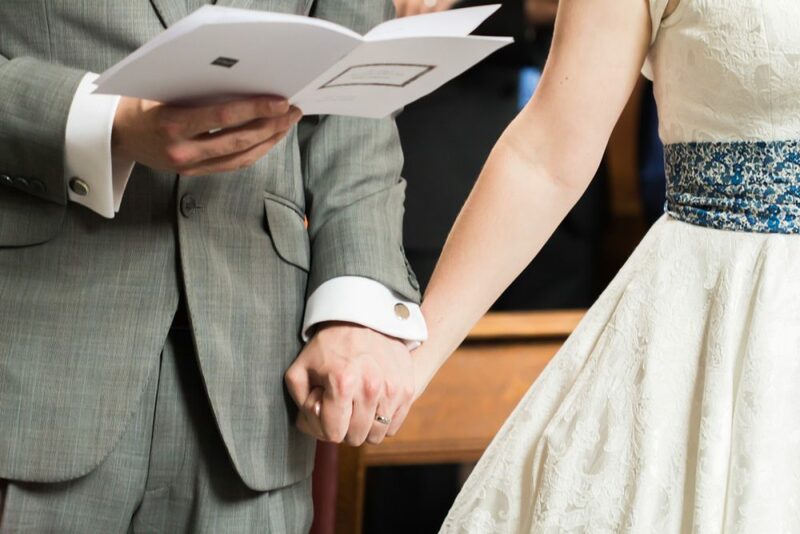 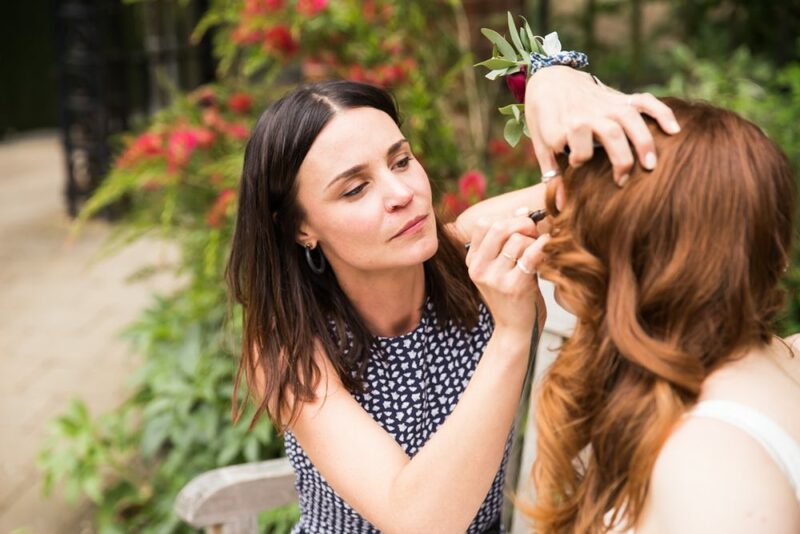 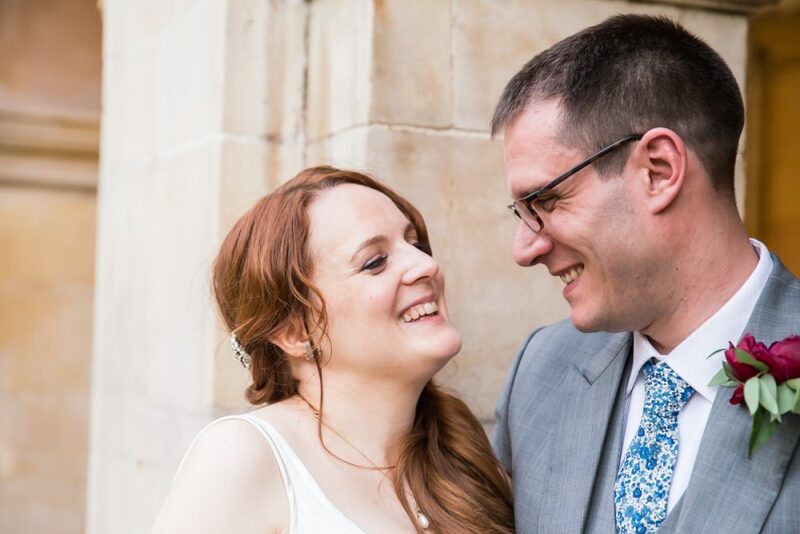 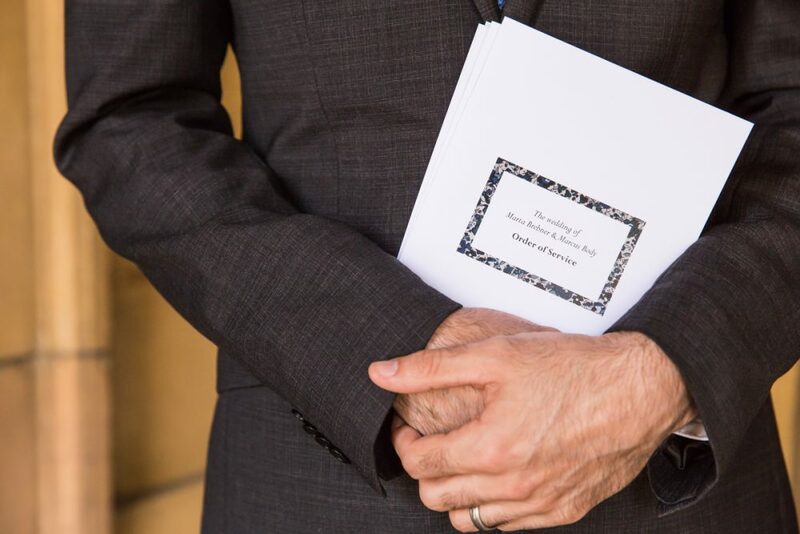 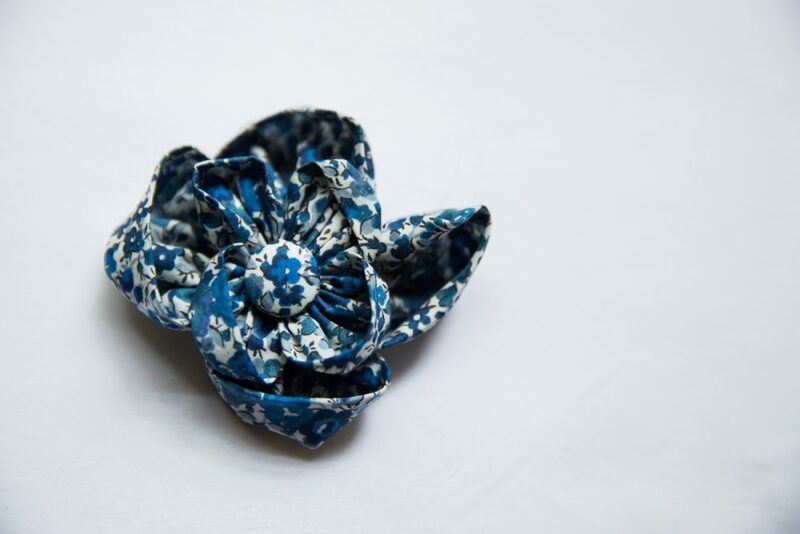 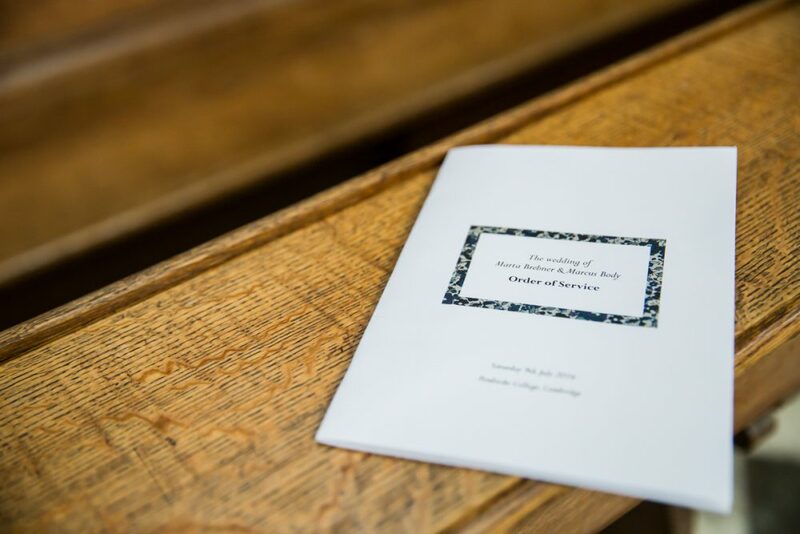 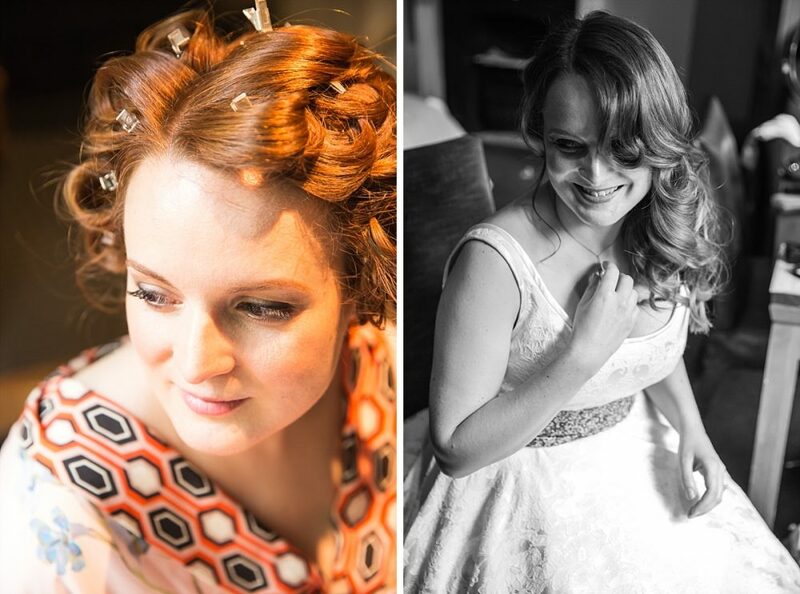 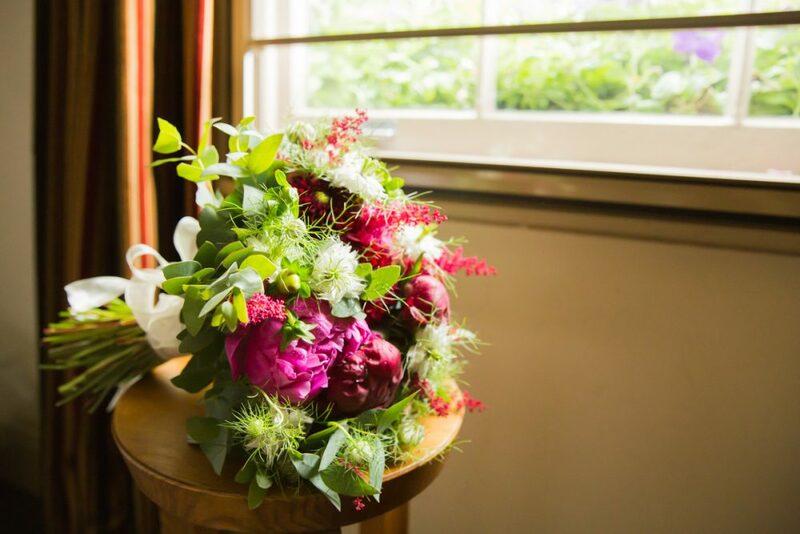 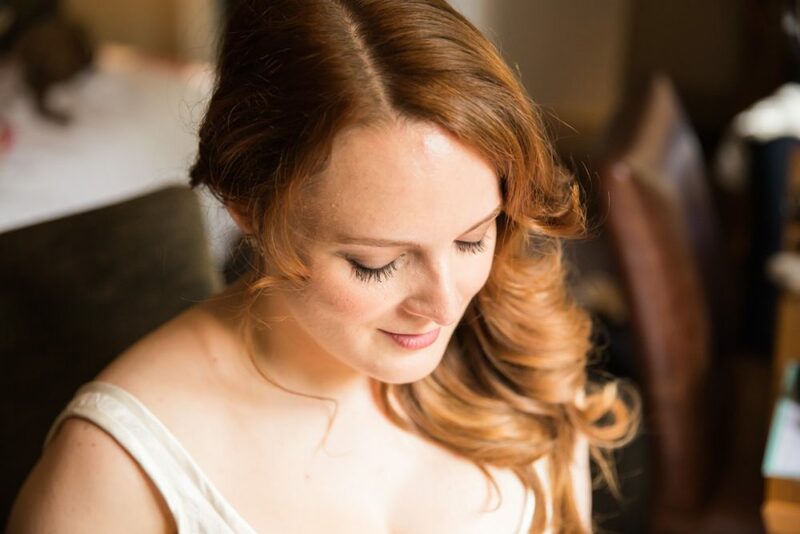 It was a really personal wedding – not only because of the college connection – Marta handmade gifts for the wedding party, a friend did Marta’s makeup, a family member played the Pembroke Chapel organ while other friends provided flute music and singing. 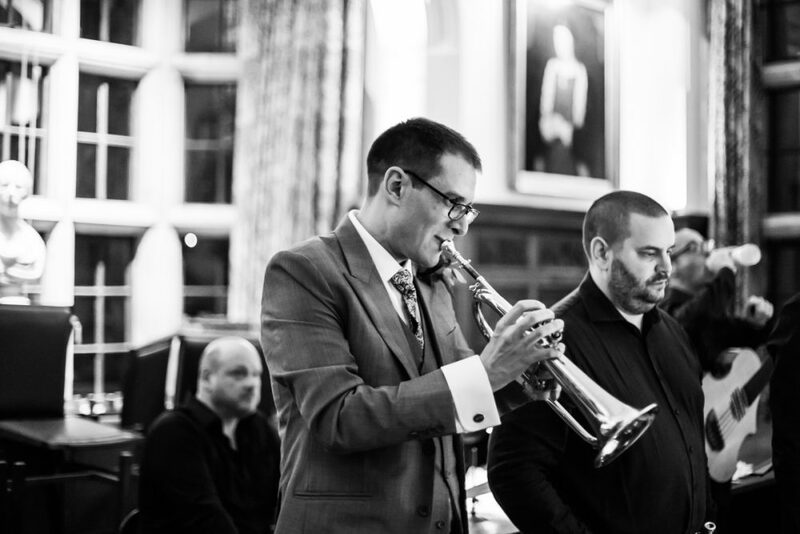 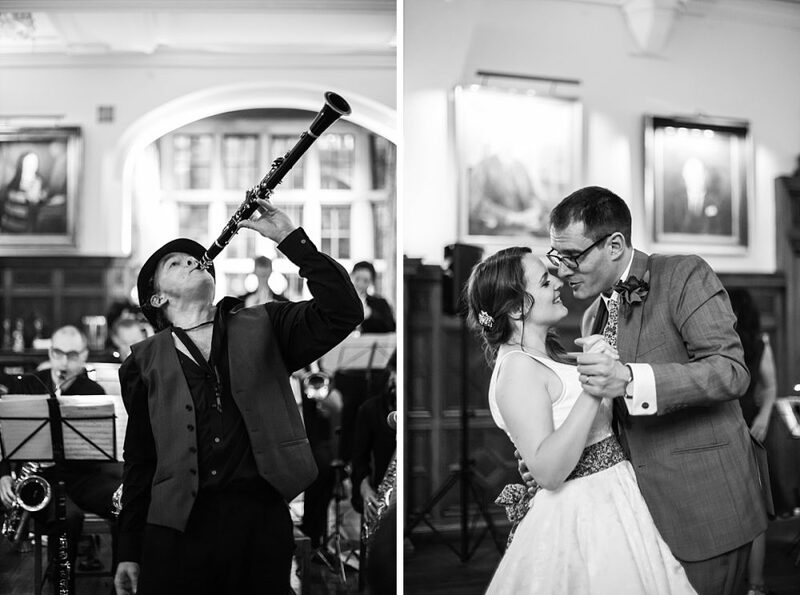 Music is very important to Marcus and he even picked up a trumpet to join the big band he plays in at the reception. 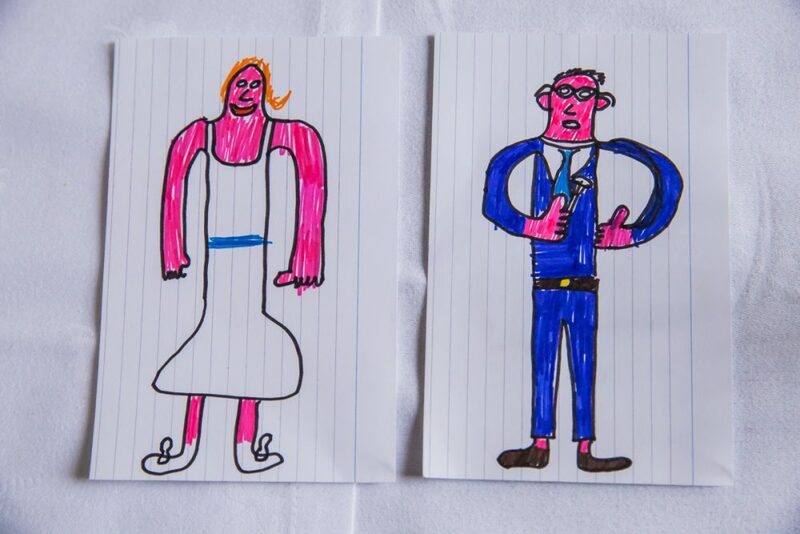 Unexpected family talent was also on show as a little guest created some very special felt tip portraits of the bride and groom which they brilliantly recreated! 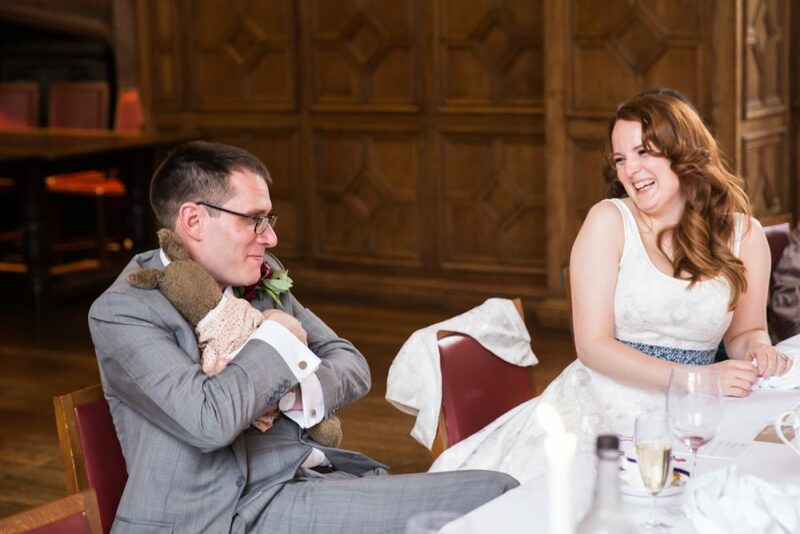 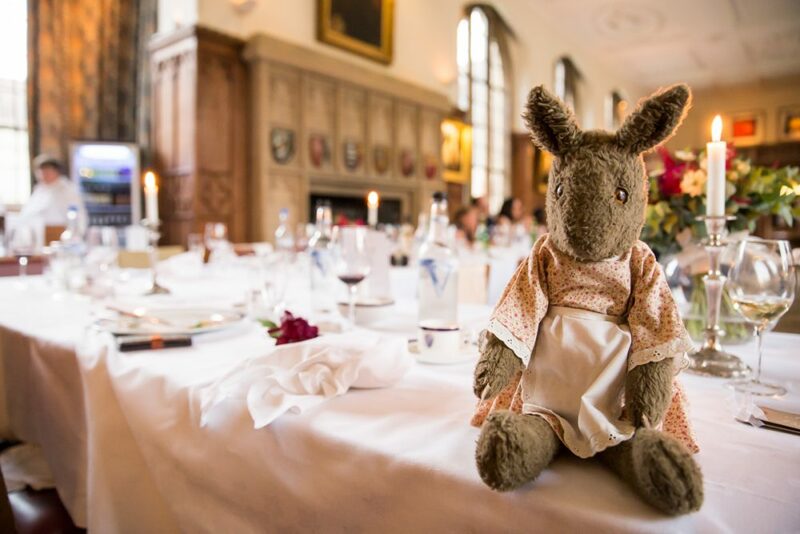 And even a very old family friend turned up – the groom’s well loved childhood toy Mrs Bunny made a surprise appearance in the wedding speeches leaving Marcus briefly at a loss for words and Marta helpless with laughter. 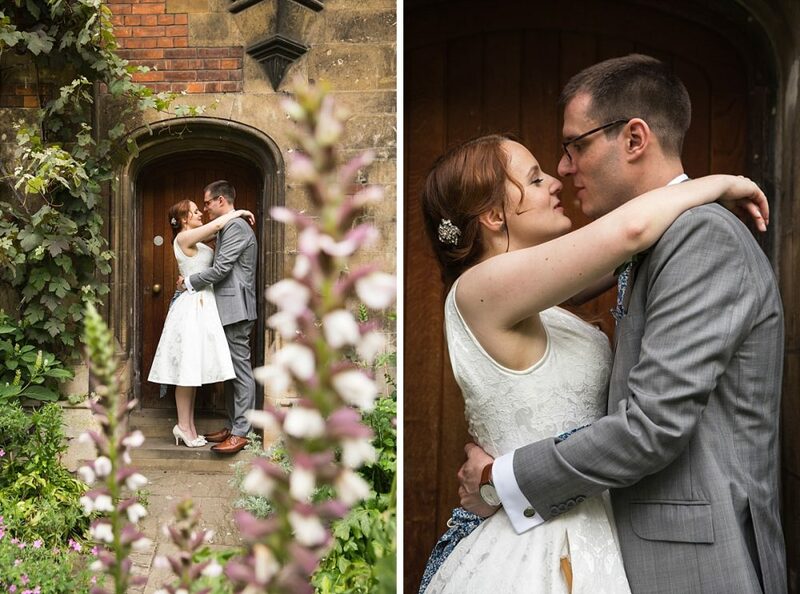 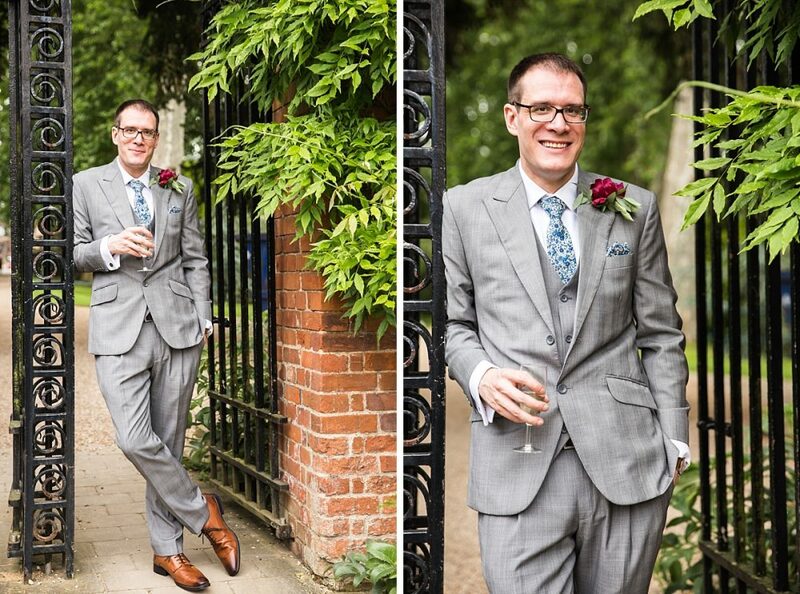 The College grounds were beautiful to walk around and full of flowers – perfect for relaxed, romantic portraits. 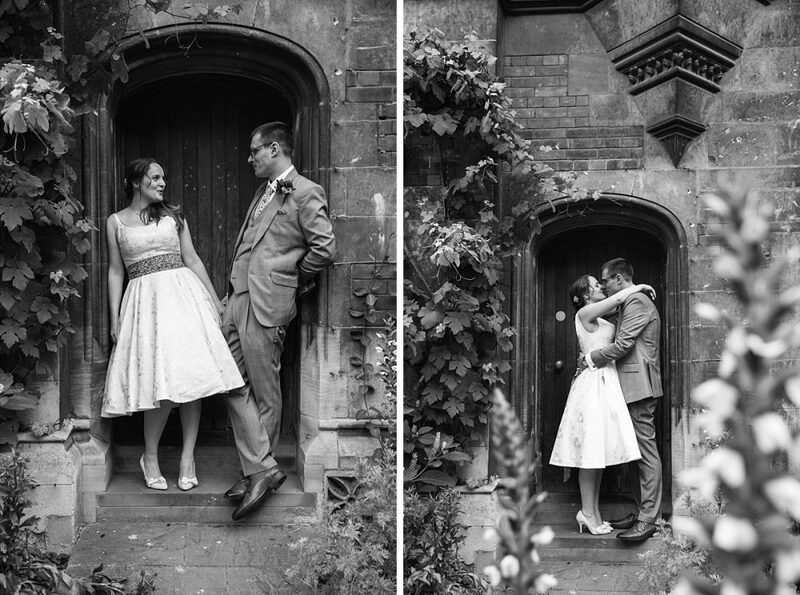 After the speeches, I asked Marta & Marcus to slip out for a few minutes for some evening photos, stealing kisses and twirling under the Pembroke College arches. 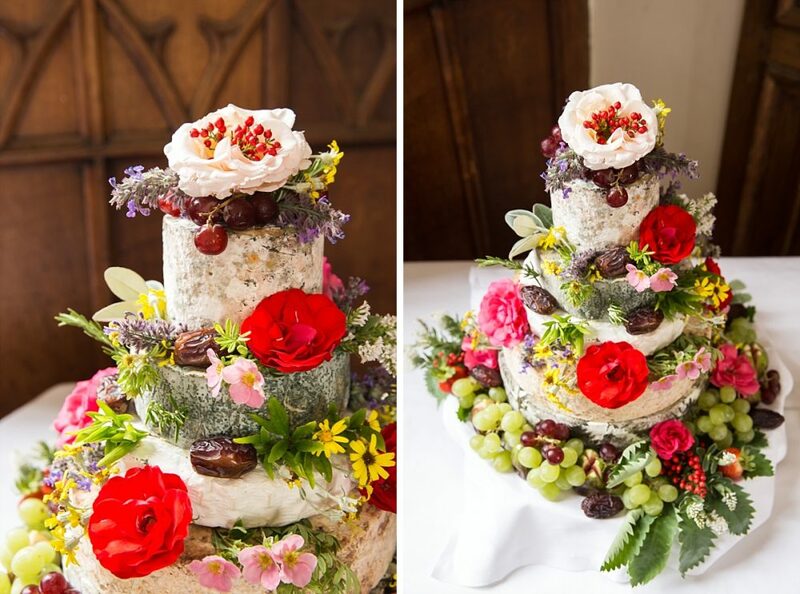 Then they headed back inside to enjoy their amazingly decorated tower of wedding cheeses and dance late into the night. 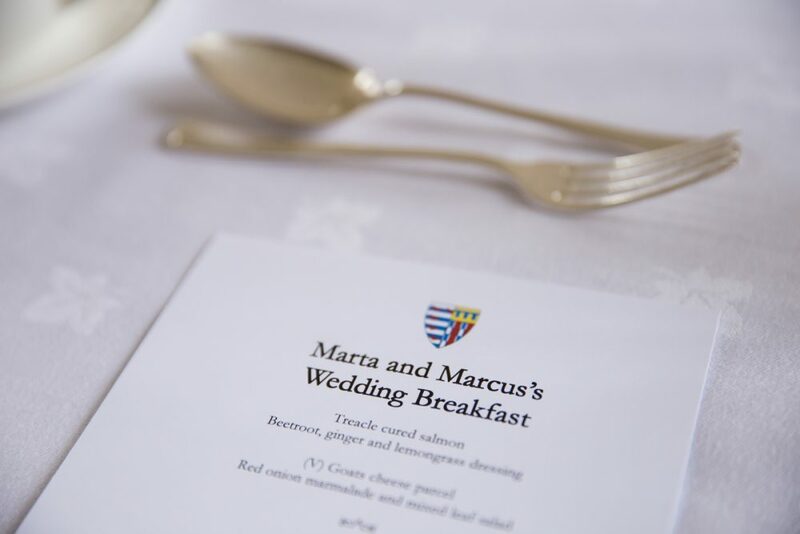 It was a pleasure to photograph Marta & Marcus’s beautiful Pembroke College Wedding. 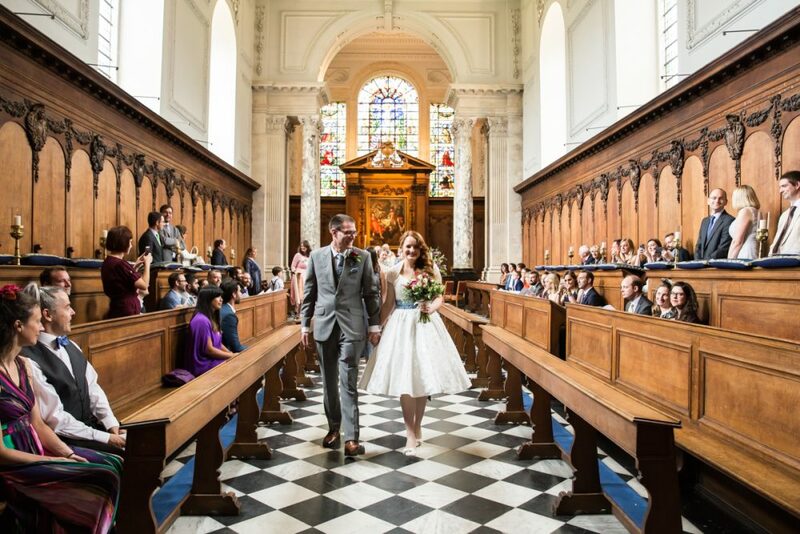 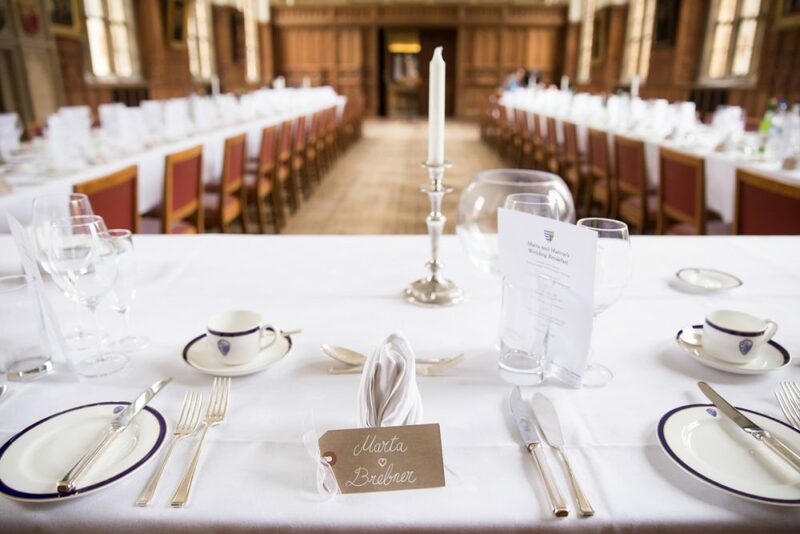 If you love the look of this Cambridge college wedding you might like to see more of my wedding photography and if you’re planning a wedding please contact me to photograph your wedding.